· Telesales staff need to book a sales person for an appointment with a prospect. · Dentists might define a service type for a check-up that takes 20 minutes and requires the customer to be allocated an appointment with their preferred dentist. · An estate agent might have his day chopped into 45 minute slots for showing prospects around to view a property. · A service engineer might need to visit a customer with some tools and equipment if a case cannot be resolved. Service activities are similar to appointments in that multiple resources can be booked for a particular time and show up on the service calendar. Service activities can be used to book equipment and resources, in addition to users and customers, and have a schedule button available to help identify available times. Each service activity must have a subject and a service type and a start and end time. The service type indicates the default duration of the activity and the resources required (see below). Service Activities can be created manually as for any activity but are often created with a scheduling process which indicates the next available timeslots where all required resources are available to fulfil the service activity. Equipment can be defined against a business unit and might represent a facility such as a meeting room or a physical item such as an LCD Projector. Equipment is defined in the settings-business management-equipment/facilities area for each site and can have an email address and a time zone. Equipment and facilities can be made available for particular working hours and also be defined as located at a particular site. The scheduling facility makes use of this data to provide information on resource availability for each site when a new service activity is being created. Taking advantage of the various options for configuring service types (see below) can satisfy simple scheduling requirements, such as allocating appointments at a dentist, as well as complex servicing activities requiring the booking of various items of equipment and engineers at different sites and taking into account the working hours for different shifts and the preferences of each customer. A service type must be defined in the services-services area (or in settings-business management-services) before a service activity can be scheduled. The service type is used to define how long a service activity might take and the required resources so that the available time slots can be determined by the scheduling process. The default duration and start activities values determine the time slots available during the day and the required resources indicate which resources are required to perform each service activity. · A LCD Projector (equipment). · A sales person chosen from the London Sales Team. · A Meeting Room chosen from any of the rooms in the London Meeting Rooms Resource Group. 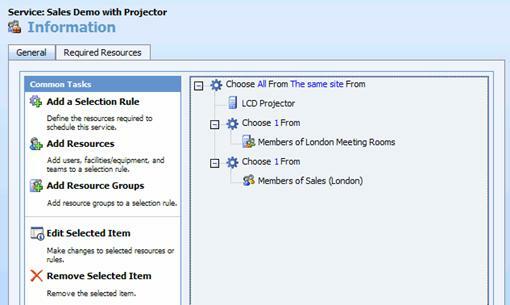 Resource Groups can be set up for interchangeable items in which case the Choose 1 From rule is selected. Alternatively a set of items can be combined and the Choose All rule specified so that all items in the group must be available to be scheduled for the service activity. 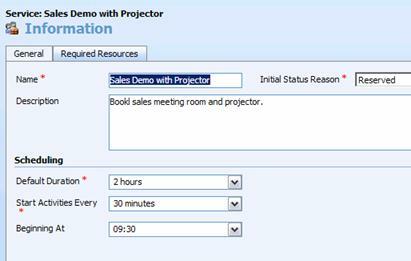 Double click on the wheel shaped icon of the selected resource to determine the capacity requirement (maybe you need two LCD projectors) and whether you want to choose the resource at random or select the least or most busy resource. The least busy option means that the least used meeting room is booked at any one time. 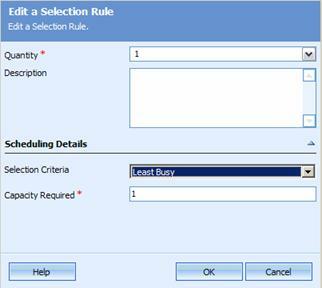 Note: The more arrow in the scheduling details section needs to be pressed to specify the selection criteria. The creation of a Service Activity requires that a service type is selected to make the scheduling process available to help book a time when the required resources are available. 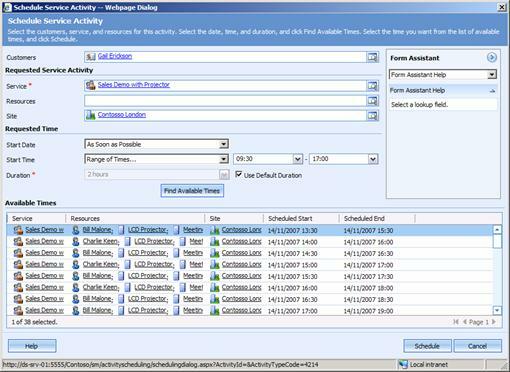 Booked Service Activities appear in the service calendar and may be synchronised with Exchange and accessed from Outlook. 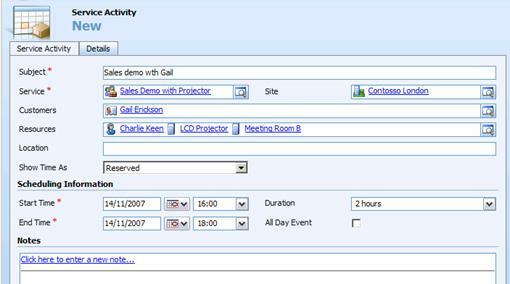 The schedule button shows the next free time at which all the resources required are available and allows them to be booked against the scheduled activity. 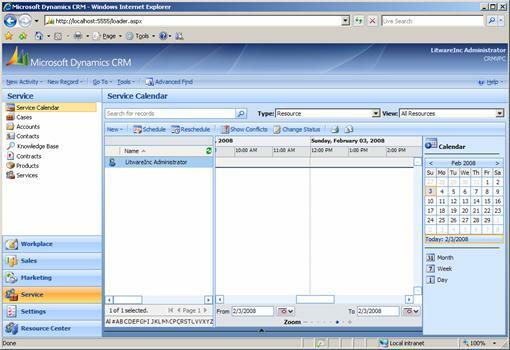 The service and the site should be specified before the schedule button on the service activity form is pressed. Preferred resources can be allocated to each customer so, for example, the regular service engineer that usually visits the customer can be the preferred engineer to book if available for a service call. This is available (by default) in the administration tab of the customer form. 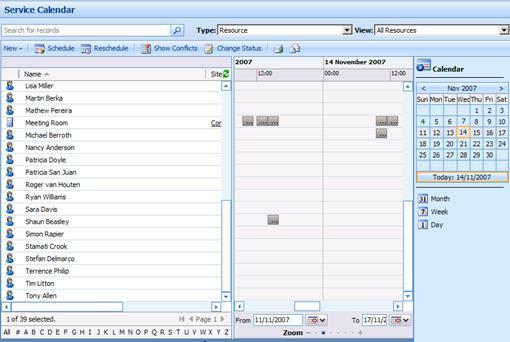 The service calendar is more detailed than the workplace calendar which shows only information relating to the current user. · New Service Activities can be created with the schedule button. · Clicking on a service activity allows the reschedule button to suggest alternative dates (when all resources are available). · Show conflicts helps the administrator resolve any double bookings. · Change status changes the status of the service activity (for example from reserved to completed). 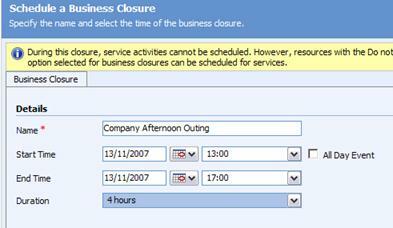 Business Closures allow public holidays and company closures to be specified and interact with the scheduling of resources.